Today we will drive to Fes passing by Rabat and Meknes. We will visit important places in those cities as well as the Roman ruins. Then we continue to Fes where we’ll arrive in the evening and here we stay overnight in a traditional Moroccan riad. In the morning we will spend visiting the medina (the old city) and its alleys. It includes visiting the Jewish Quarter and the Royal Palace, which is the biggest one in the country. Then we will visit the famous tanneries and the Quaraouine mosque – the first university in the world . After lunch, we will enjoy a wonderful panoramic view of the city and you will have free program. We stay overnight in local hotel in Fes. Today we’ll drive towards Ifrane – referred to as “the Switzerland of Morocco. We will stop at Azrou, a Berber village in the middle of the famous cedar forest. Lunch will be in Midelt in a traditional Moroccan restaurant , then afterwards we’ll travel through the Tizi Ntalghamt pass and along the magnificent Ziz Gorges carved through volcanic rock and along the spectacular Ziz Valley, stopping for panoramic views along the way. We’ll drive through Berber villages to Erfoud and then Rissani, and finally we reach Merzouga. Here we stay in lcoal hotel near desert dunes. 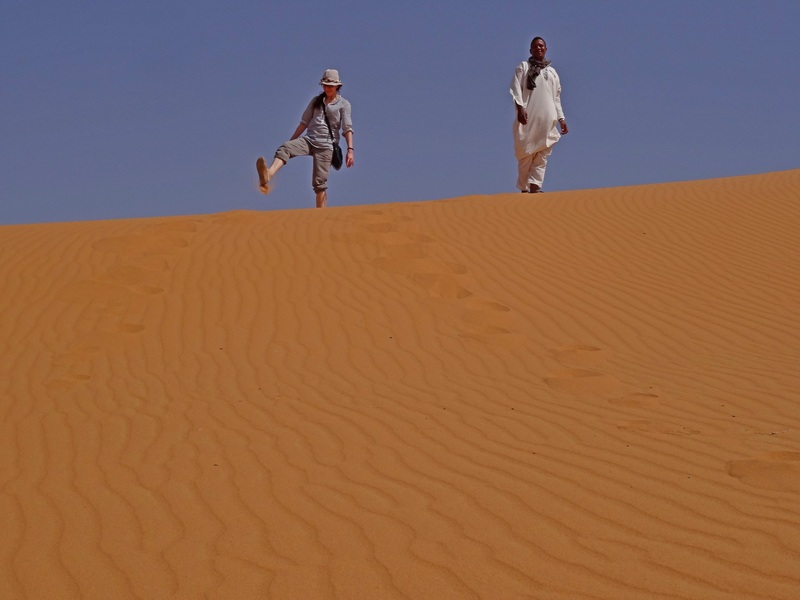 Day 4: Merzouga area – the Camel trek and overnight in the camp. Today we’ll explore the desert area by visiting the Gnawa people in village Khamlia. We can also meet Nomad families still living under Berber tents. We will also visit the old city of Rissani, the foundation of the Alaouite dynasty – the current ruling royal family in Morocco. Here you’ll walk through the souk and later we will drive back to the village of Merzouga, from where you will ride camel into the desert. The camel ride takes about 90 minutes to arrive to the desert camp. Here we will spend the night in the middle of sand dunes. You will enjoy the sunset and today’s dinner will be served at the desert camp with Berber music at campfire. Day 5: Merzouga -Todra Gorges – Dades Gorges. Our camel guide will wake you up early in the morning to watch sunrise, then we’ll ride camel back to the village . After breakfast and shower in the hotel, we’ll leave for Rissani, Tinghir and Todra gorges – the highest, narrowest gorges in Morocco. After lunch in the heart of the gorge we’ll drive through the Dades Valley. We stay overnight in traditional hotel with dinner and breakfast. Day 6: Dades gorges -Ouarzazate -Ait Ben Haddou – Marrakech. After breakfast we’ll drive through the Dades Valley towards Kalaat Mgouna and Ouarzazate. The route through Dades Valley is the way of the thousand Kasbahs – providing numerous opportunities to take some of your best photographic shots of the trip. We’ll stop at Kalaat Mgouna, “the rose city”. Our journey continue to Marrakech passing by Ait Ben haddou Kasbah, the largest Kasbah in Morocco. The Kasbah was built by Et Hami El Glaoui, one of the last Berber chieftains during the 18th century, now it is a house of many Glaoui people. We wil pass Tizi n’tichka Pass (2260m) over the High Atlas Mountains. After we reach Marrakech , our Morocco tour finish.